ISLAMABAD : President Asif Ali Zardari has said Pakistan stands committed to ensure equal rights to all minorities, as enshrined in the Constitution, and all measures will be taken for their complete freedom and security. In a message on the ‘Minorities Day’, President Asif Ali Zardari said “Minorities are a sacred trust for Pakistan,” and pointed that father of the nation Quaid-e-Azam Mohammad Ali Jinnah made this solemn pledge at the time of creation of Pakistan in categorical and unequivocal terms. Quaid-e-Azam also made it clear that the policy of equality, freedom and security for all communities shall be ensured. The President said, the constitution, through various provisions lays down that the minorities can freely profess and practice their religious and culture and envisages to safeguard their legitimate interests for which the People’s government stands fully committed. He said the government has made necessary institutional arrangements, which guarantees safeguards for political participation and welfare of the Minorities. 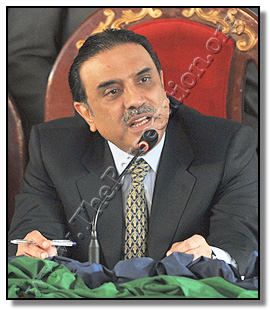 President Zardari said the present government has taken a historical step of reservation of 0.5 percent quota in government jobs and services for minorities which will ensure their due representation at all level. He said the government is making all-out efforts to impart sense of equal citizenship so far as fundamental rights, safety, security, honour, life, liberty and properties of the minorities are concerned. “Unfortunately, some extremist elements with a view to advancing their own narrow and bigoted agenda have targeted the minorities, as happened recently to members of the Christian Minority in Gojra,” President Zardari said. The government is committed to foil the designs of these extremist elements, he added. He said, August 11 was being observed to reaffirm solidarity with the minorities. The day coincides with the vision of the great leader of the nation Quaid-e-Azam Muhammad Ali Jinnah, who on this day in his historic speech laid down the foundations of a modern, tolerant and progressive Pakistan where every one will have rights regardless of creed, caste and gender. The President said, the government stands committed to ensure equal rights for all minority communities as enshrined in the constitution and the UN declaration of Human Rights. “The minorities’ day is an opportunity that reminds us to reaffirm our solidarity and to work hard for the betterment of humanity and for a prosperous Pakistan”, he observed and added that “let us on this day dedicate ourselves to continue our journey along this road”.